Can’t get enough Dragon Quest? 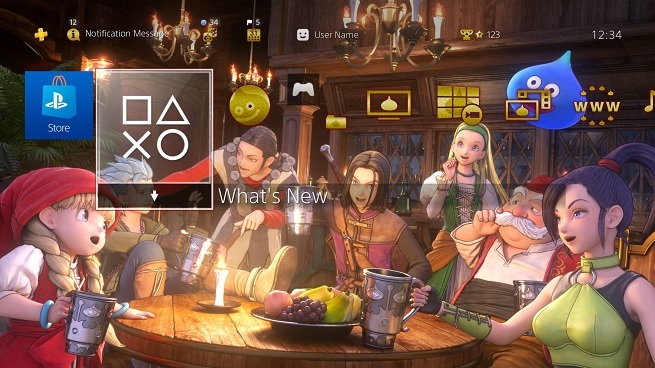 For all of you Dragon Quest XI super-fans out there, or for anyone who just likes free stuff, there is a free Dragon Quest XI PS4 theme and avatar bundle available on PSN right now. You can find the theme right here, and check out the avatar bundle here. For our European readers, you can find everything you need here. The gang is all here. Dragon Quest XI: Echoes of an Elusive Age features one of the most lovable casts of characters in any modern role-playing game (check out our review), and now you have the perfect opportunity to rep your favorite party member. With the avatar bundle, sport a gorgeous portrait of The Luminary, Erik, Veronica, Serena, Sylvando, Rab, or Jade to let the world know that you play world-class JRPGs. If you want to appear truly cultured, of course, you’ll use the Sylvando avatar (but we didn’t have to tell you that). The theme is absolutely gorgeous, boasting two images of the entire Dragon Quest XI party hanging out together. This is a dynamic theme which will rotate between both images as you peruse different parts of the PS4 home screen, and each image has its own unique theme and tone. That muted, gray-scale lineup is charming in an “90s alternative band cover album” kind of way. What this image lacks in color it makes up for in variety. This lineup beautifully parades the diversity of Dragon Quest XI’s cast. The second image is practically bursting with color. It’s warm, and hearty, and shows all of our party members relaxing and having fun together. The smile on The Luminary’s face shows his gratitude to be surrounded by great friends, and for anyone who has spent dozens of hours playing Dragon Quest XI (there are millions out there), that feeling of being surrounded by friends is mutual.